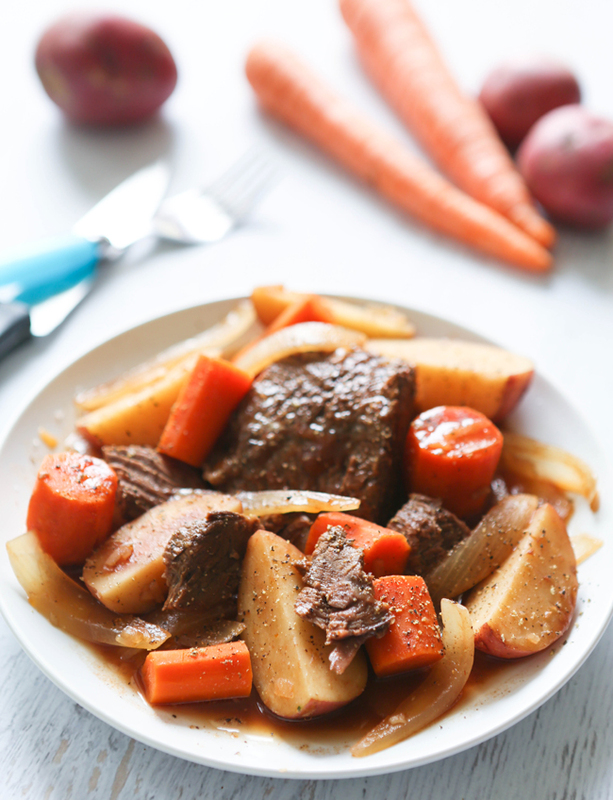 Slow Cooker Tender Pot Roast Recipe — Pip and Ebby - easy, delicious recipes! Let dinner be delicious and effortless. Combine potatoes, vegetables and a roast over flavorful spices and let them simmer together through the day. 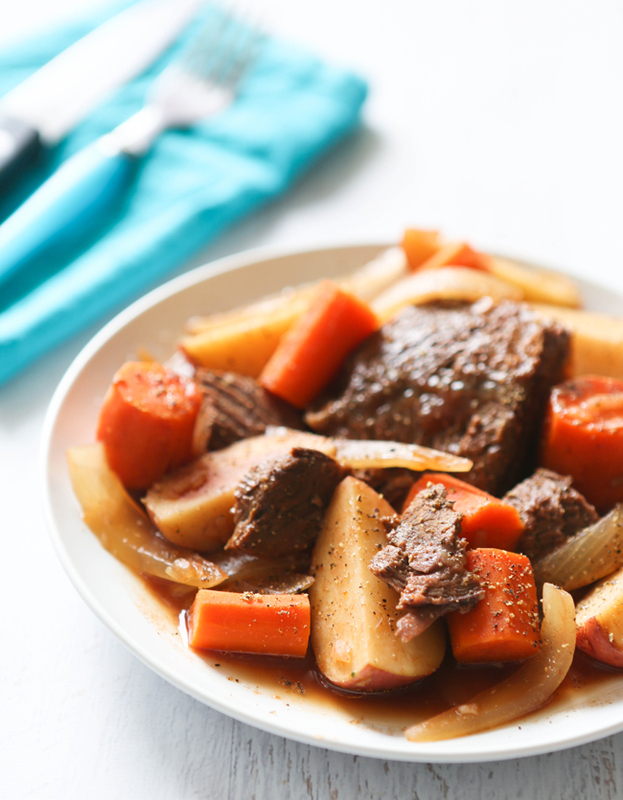 This flavorful Pot Roast made in a slow cooker makes dinner EASY! Despite summer practically being here, I am still using my crockpot like a champ. This pot roast was so delicious, you guys. It was tender, totally packed with flavor and just plain delicious. Throw a 2-3-lb. roast into your slow cooker, along with an onion, carrots, potatoes, beef broth, worcestershire sauce, tomato paste and a packet of beef recipe soup & dip mix. Stir it up a bit and throw on the lid. Cook on Low heat for 8-9 hours or High heat for 5-6 hours. Thanks for reading. Enjoy the recipe! If you happen to be as obsessed with easy crockpot recipes as I am, please check out my Slow Cooker Chicken Pot Pie and my Sweet and Tangy Crockpot Chicken! 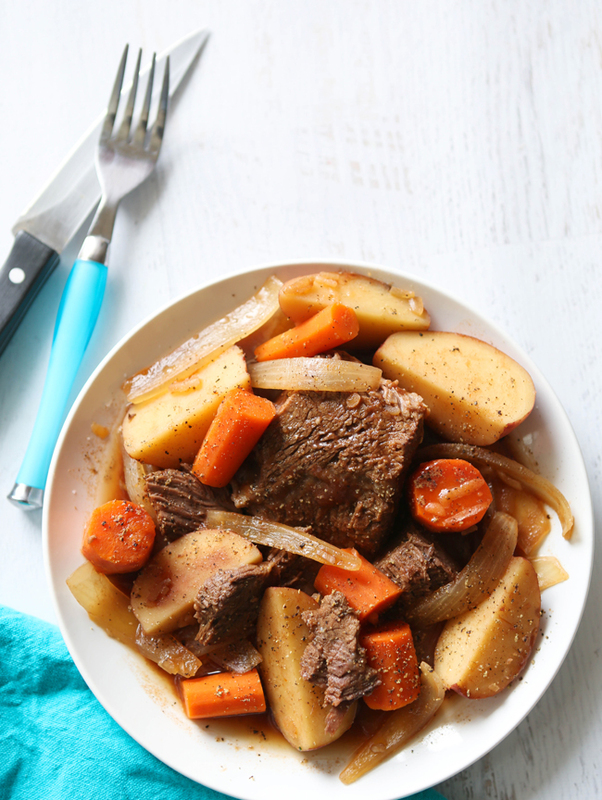 This is the most flavorful, tender pot roast that has ever been made in my kitchen. Place roast inside a large crockpot. Add potatoes, carrots, onions, beef broth, worcestershire, tomato paste and soup/dip mix. Stir, cover and cook on Low heat for 8-9 hours (or 5-6 hours on High).